Cubital tunnel syndrome is a condition involving the ulnar nerve at the elbow, often referred to as the “funny bone” nerve. The ulnar nerve travels around the elbow and into the forearm and ultimately ends in the hand. The cubital tunnel is the name of the space along the inside of the elbow. It is possible that this space may be too tight or the nerve can be overstretched as it passes through this tunnel. Common symptoms include, numbness/tingling, pain and weakness in the hand. The nerve acts like an electrical wire that sends signals to and from the hand. 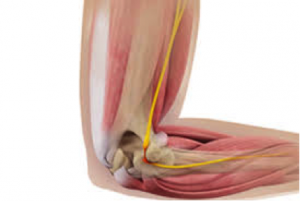 When this nerve is stretched or compressed at the elbow, the electrical signals can be slow which can cause numbness or tingling, usually in the ring and small fingers. You may also experience pain in the elbow or forearm. Weakness can also develop in the hand muscles which can cause decreased strength with gripping or pinching. Symptoms often become worse at night due to the position of your elbow or with activities such as holding your cell phone or when leaning on your elbow. Your doctor may refer you for a nerve test which exams the nerve and establish if there is an impairment. The best treatment for cubital tunnel will depend on how severe the problem is and how long it has been present. Many times non-operative treatments can be tried first. These may be including changing activities or avoiding leaning on the elbow. Pressure on the nerve may increase when the elbow is bent for a long time, such as while holding a cell phone or while sleeping. Wearing a splint at night, or loosely wrapping a towel around the elbow, may help keep the arm straight and improve the problem. Also wearing an elbow pad during the day which provides a cushion to the elbow may prevent numbness and tingling in the ring and small fingers. If conservative options fail you should consult with a hand surgeon. The hand surgeon will establish if you are a candidate for cubital tunnel syndrome surgery. The surgery involves removing pressure on the nerve and protecting it from further damage. There are several methods of doing this. The surgery will release any tight structures surrounding the nerve, and may involve gently moving the nerve to a new location. Most patients go home on the same day with medication to control any discomfort. You will be placed in a splint for a couple of weeks to limit early motion during healing. Most people return to normal activities by 6 weeks with the exception of heavy lifting. At times the symptoms of numbness, tingling and pain resolves quickly, however in more severe cases, recovery of the nerve may take longer.